The definitive guide to one of the most baffling epics of nineteenth-century literature—a companion to The Annotated Alice. "It's a Snark! "…for whatever else can it be?" Published on April Fools' Day in 1876, Lewis Carroll's The Hunting of the Snark remains one of the most amusing and bizarre works of modern verse. 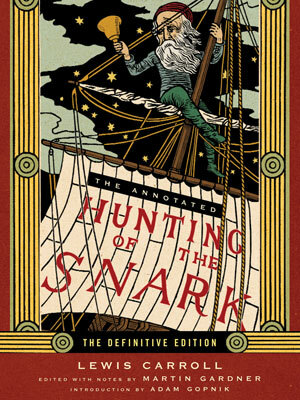 Carroll, who completed this classic poem eleven years after the publication of Alice in Wonderland, invites readers along on a fictitious hunt to determine who—or what—the Snark actually is. More than 130 years later, the indomitable Martin Gardner returns to the Snark with a trove of new annotations and illustrations, uncovering some of the most confounding literary, linguistic, and mathematical references embedded in any of Lewis Carroll's many works. Included in this gorgeous, two-color volume is an introduction by Adam Gopnik, as well as Henry Holiday's distinctive, original illustrations, a substantial bibliography, and a suppressed drawing of the infamous Boojum. With a host of other Snark resources, this is the most ambitious work on Lewis Carroll's masterpiece in many decades.